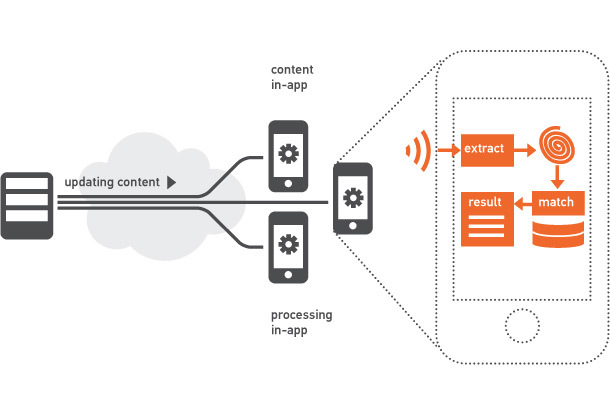 audioid in-app recognition is designed for the stand-alone operation of mobile devices. The fingerprints of the relevant content are preloaded to the mobile application and audioid in-app recognition does the matching of the recorded audio snippets right on the mobile device. It does not need to send any data to a server and therefore there is no need for an Internet connection during the audio recognition. It is all done on the device itself. audioid in-app recognition enables broadcasters, advertising agencies, content producers and application developers to achieve greater consumer attention by giving consumers the chance to interact with TV Series, movies, commercials, live shows and other audio cues. Makes traditional media interactive: easy and effective recognition of commercials, TV shows, videos that play on TV, radio etc. Please enter your contact details to receive the demo app for audioid in-app recognition.